A new magazine dedicated to ‘Dutch delights’, Hollands Glorie offers anything from local beauty spots to Dutch design, fashion, cooking and special hotels. 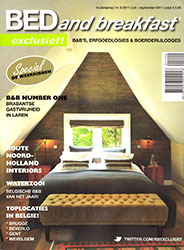 This issue features boutique hotel Museum Suites. This exclusive magazine presents the prettiest places for spending the night in the Netherlands and Belgium, including Museum Suites. COOL AMSTERDAM is a lifestyle guide featuring unusual and surprising hotels, restaurants, clubs, bars, lounges, shops and sights. The most beautiful hotels have been included, both small, exclusive boutique hotels like Museum Suites and a few large hotels from well-known chains. A Dutch holiday special published by upmarket women’s magazine Flow, featuring 208 tips for holidays and short breaks, all supplied by friends and acquaintances of Flow editors. Museum Suites is named as one of the best addresses.